Few poetic forms have found more uses than the sonnet in English, and none is now more recognizable. It is one of the longest-lived of verse forms, and one of the briefest. 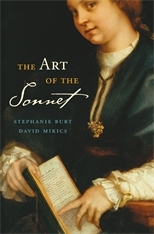 A mere fourteen lines, fashioned by intricate rhymes, it is, as Dante Gabriel Rossetti called it, “a moment’s monument.” From the Renaissance to the present, the sonnet has given poets a superb vehicle for private contemplation, introspection, and the expression of passionate feelings and thoughts.